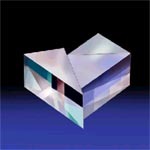 Located behind the projection lens is an optical box, the component that processes light within the projector. It is designed exclusively by Canon to deliver superior color quality. Canon uses its industry-leading expertise in optical technology to set a new standard in image quality for micro-portable projectors. Its parts do not all intersect at one point. This eliminates the appearance of faint vertical lines in the projected image. No two LCD panels face each other. This prevents the unwanted transmission of light onto an opposing LCD panel, which can disrupt the panel from operating properly. 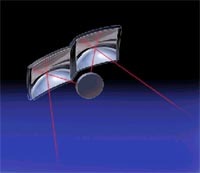 As a result, the Clear Prism ensures high resolution in the red and blue channels for clearer images. 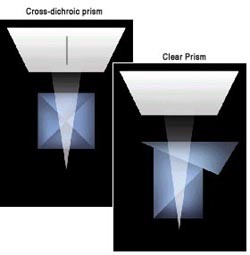 Comparison 1: In a cross-dichroic prism, the appearance of faint vertical lines is caused by light passing through the intersection of its parts. The Clear Prism eliminates this. 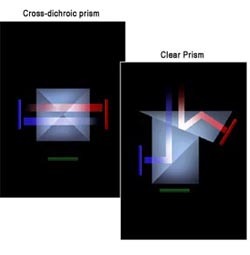 Comparison 2: The structure of the Clear Prism prevents different color channels from interfering with each other. Purity of colors is thus maintained. The free surface mirror is another example of how Canon effectively uses its optical know-how to produce a better, more reliable compact projector for business and home theater applications. It helps minimize the number of parts used to process red light inside the optical box. 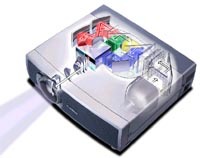 It contributes to a lighter and more compact body, an essential feature for micro-portable projector users. Developed specifically for brightly lit rooms, Canon's new Turbo Bright System increases the brightness of projected images by 25%. Most projectors reduce the orange light (wave length: 570 ~ 600nm) to balance out the colours. In contrast Canon's sophisticated Turbo Bright technology utilises the orange to optimise the light rays from the lamp through the projection lens - without distorting the overall colour balance. The result is clear, vivid projection of text, data and images - even in well lit conditions. When projecting in darker rooms, simply switch back to the standard mode for the finest natural colours Turbo Bright can be used whenever you use your Canon projector without any increase of power consumption, lamp wear, or cost.